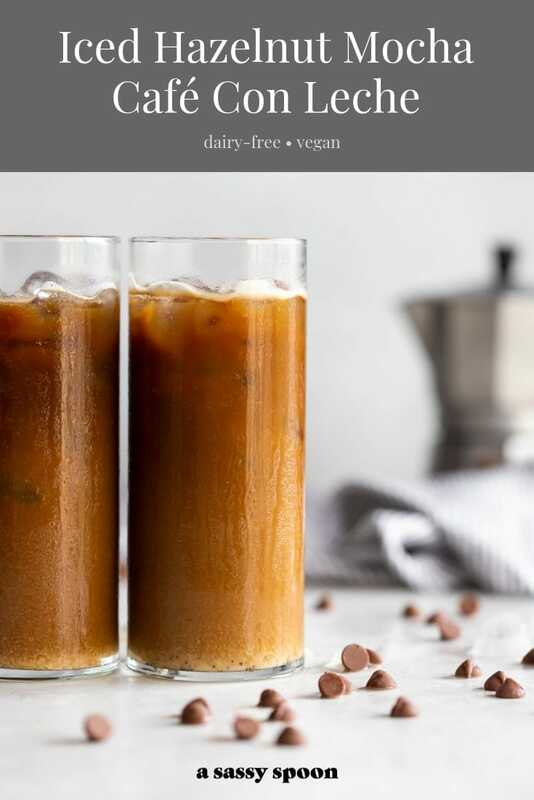 A frothy dairy-free iced cafe con leche (milk with coffee drink) made with sweetened Cuban coffee, chocolate chips, hazelnut creamer, and almond milk. 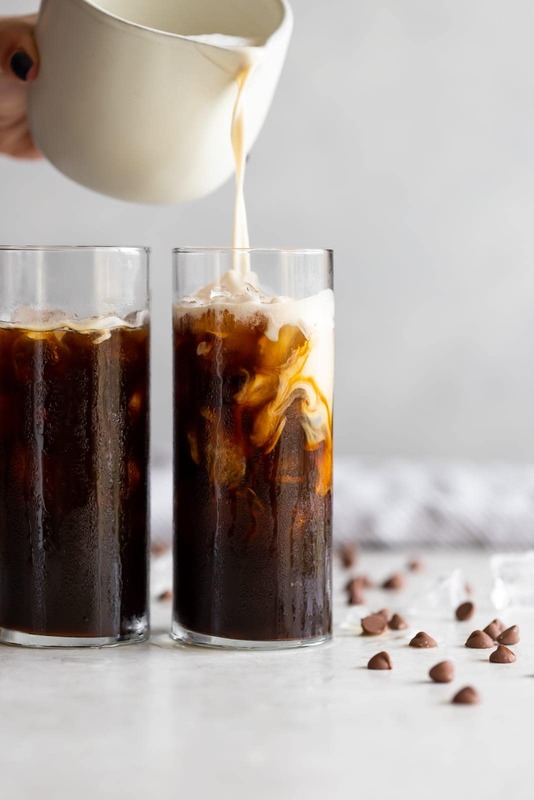 This post is sponsored by Califia Farms. All opinions are my own. In my world, a cafe con leche was a breakfast staple. Growing up, I remember my dad having one every morning with a slice of Cuban toast with butter. He would dip the Cuban toast into the cafe con leche. And that was breakfast. It was so normal. I even remember how he would froth the whole milk. He would pour it from one mug to the other, back and forth, until it was cool enough to drink yet still hot and foamy. I’ll never forget those memories. 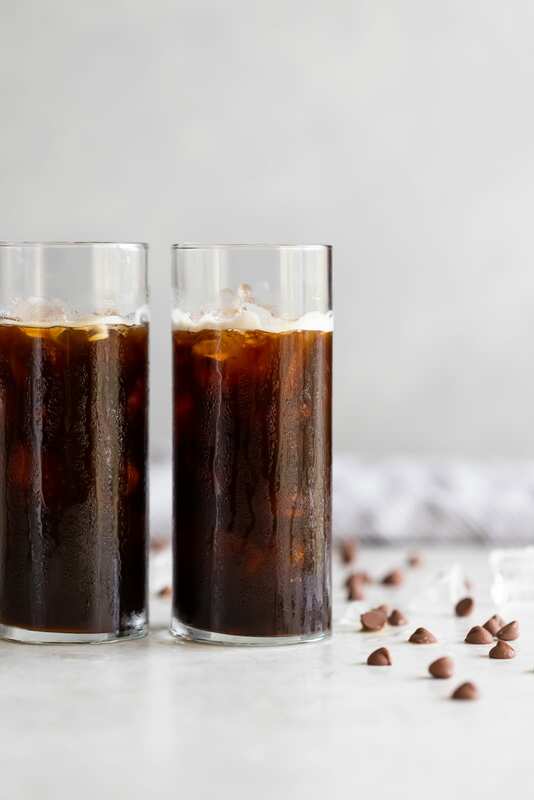 Today, I wanted to share a modern version of the iconic Cuban beverage by making an iced version with chocolate chips, Califia Farms Hazelnut Creamer, and almond milk. I don’t think my traditional Cuban father would approve of it but I definitely love it. Not to say that hot cafecito is not my jam, it totally is. Especially when it’s perfectly sweetened. But I feel like this is something I can sip on all morning while catching up on emails. And it’s dairy-free to boot! Cuban cafe con leche is usually made with whole milk because of its creamy, frothy nature. I, however, really wanted to make a version for my “team non-dairy” family and friends that can no longer stomach whole milk. And I think I found the perfect formula for an extra frothy cafe con leche. 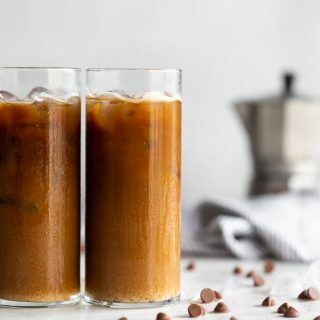 Once I was ready to put my iced cafe con leche together, I made sure to sweetened my hot Cuban coffee first (you can use a dark roast if you don’t have Cuban coffee). I added chocolate chips to an espresso cup and then I poured the coffee over it. This way the chocolate chips could melt into the coffee. It’s almost like making a “mini mocha” (shout out to Chef Megan Mitchell for inspiring this idea!). I then added a tablespoon of paleo sweetened condensed milk. Feel free to use another sweetener and/or adding more to taste. Once my hot coffee was sweetened, I let it cool a bit before pouring it into a glass with ice. I stirred in the frothy milk and creamer, and that’s all folks! Feel free to add chocolate chips on top, if you’re feeling it. Full recipe is below and it makes 1 cafe con leche but can be multiplied if you’d like to make more than 1. Can’t wait for you guys to try this one! 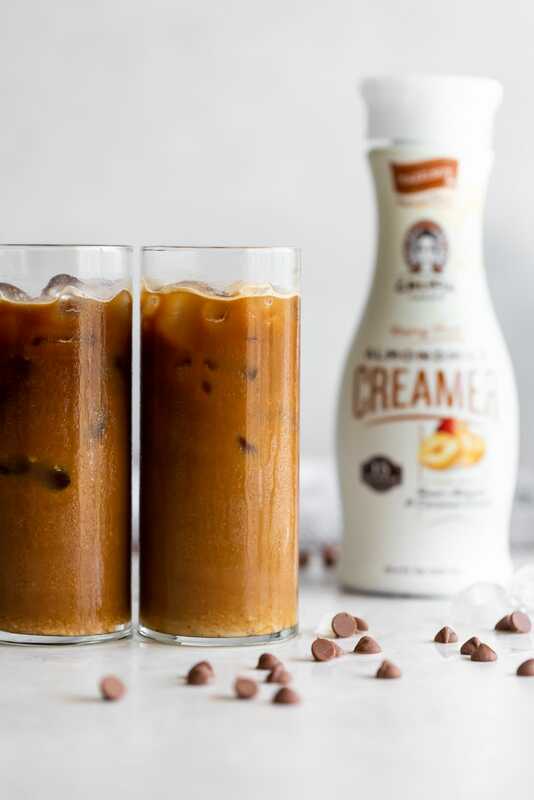 Interested in snagging up some Califia Farms Hazlenut Creamer? Click here to shop and use code SASSYSPOONxCALIFIA for 15% off + free shipping on your order. In a mug, add chocolate chips and pour hot espresso on top of the chocolate chips. Stir the espresso until chocolate chips melt completely. Stir in condensed milk or sweetener of choice until dissolved. Set aside. Into a milk frother, add almond milk and hazelnut creamer. Froth the milk and creamer until it gets foamy and thick. * Set aside. Into a glass, add ice. 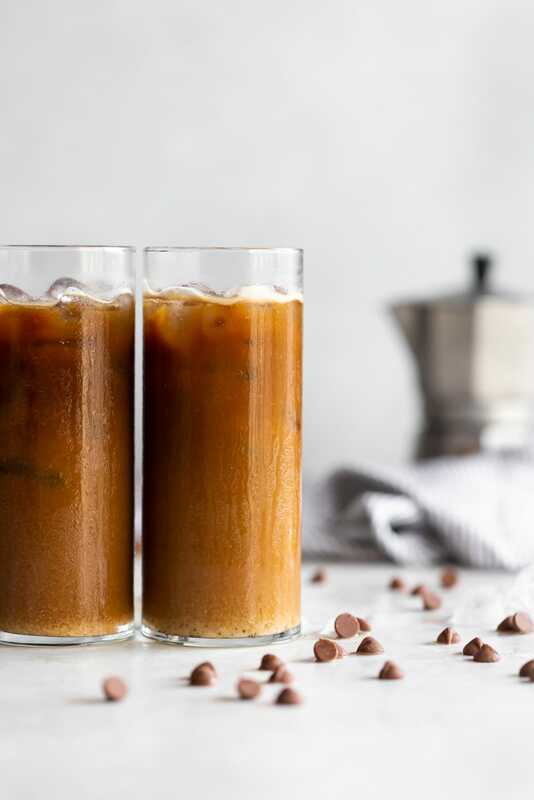 Pour espresso into the glass. Stir in milk and creamer mixture. Top with more chocolate chips, if desired. Enjoy! *I used the Aeroccino milk frother that came with my Nespresso. 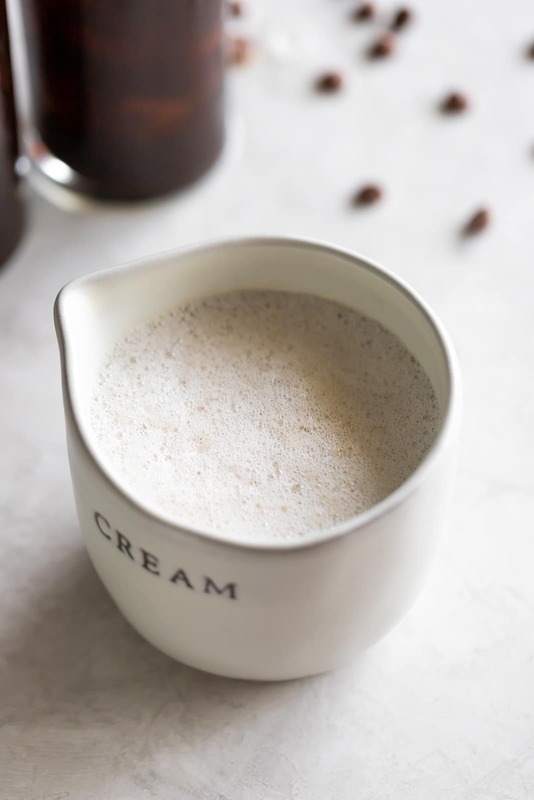 You can also use a handheld frother or, pour the creamer and almond milk into a jar and shake vigorously until foamy.